Agent Performance: An agent function implements a mapping from perception history to action. The behaviour and performance of intelligent agents have to be evaluated in terms of the agent function. The ideal mapping specifies which actions an agent ought to take at any point in time. The performance measure is a subjective measure to characterize how successful an agent is. The success can be measured in various ways. It can be measured in terms of speed or efficiency of the agent. It can be measured by the accuracy or the quality of the solutions achieved by the agent. It can also be measured by power usage, money, etc. 1Humans can be looked upon as agents. They have eyes, ears, skin, taste buds, etc. for sensors; and hands, fingers, legs, mouth for effectors. Robots are agents. Robots may have camera, sonar, infrared, bumper, etc. for sensors. They can have grippers, wheels, lights, speakers, etc. for actuators. Some examples of robots are Xavier from CMU, COG from MIT, etc. 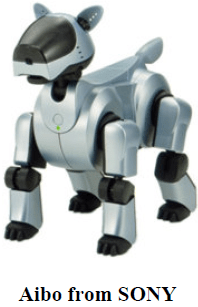 Then we have the AIBO entertainment robot from SONY. 3. We also have software agents or softbots that have some functions as sensors and some functions as actuators. Askjeeves.com is an example of a softbot. 4. Expert systems like the Cardiologist is an agent. Understanding, reasoning, learning Blind action is not a characterization of intelligence. In order to act intelligently, one must sense. Understanding is essential to interpret the sensory percepts and decide on an action. Many robotic agents stress sensing and acting, and do not have understanding.